Page revised in July 2016. Links to this page can be found in Book 2, Map B3, Day 1, View C9 and Rione Campitelli. This 1752 etching by Giuseppe Vasi shows the western part of Campo Vaccino whereas its eastern part is shown in another etching. Campo Vaccino (Cow Field) was the site of a weekly cattle market for many centuries (vacca is the Italian word for cow). In the XVIIIth century the level of the ground was higher than in antiquity and it covered most of the Roman ruins; the few surviving monuments were partly buried. The view is taken from the green dot in the 1748 map here below. In the description below the plate Vasi made reference to: 1) Arco di Settimio Severo; 2) Colonne del Tempio della Concordia (Tempio di Saturno); 3) Columns buried in the slope of the hill (Tempio di Vespasiano); 4) Colonna sola (Colonna di Foca) 5) Mura (walls) del Campidoglio (Capitoline Hill). 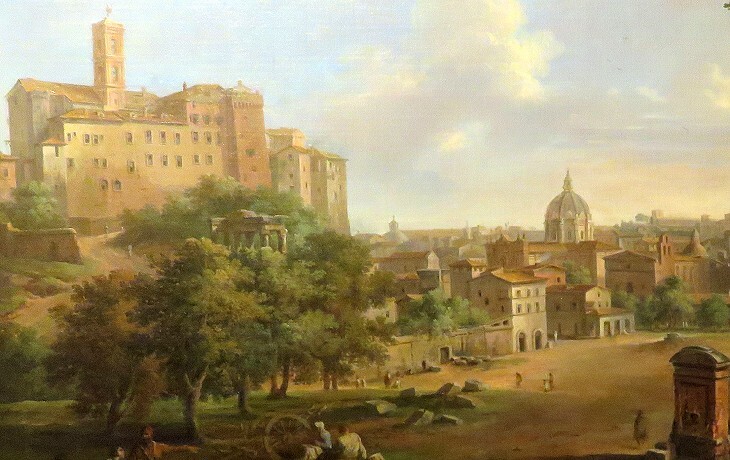 Vasi was very skilful in choosing the point from which he drew his view of Campo Vaccino. It allowed him to depict the ancient monuments, which instead are difficult to see in the painting shown above. He knew that many of his prospective customers were interested in them, rather than in landscape views of the site. In 1765 he covered this part of Campo Vaccino in a larger etching which shows some of the facilities of the cattle market. You may wish to see some paintings by Alberto Pisa showing the Roman Forum in 1905. 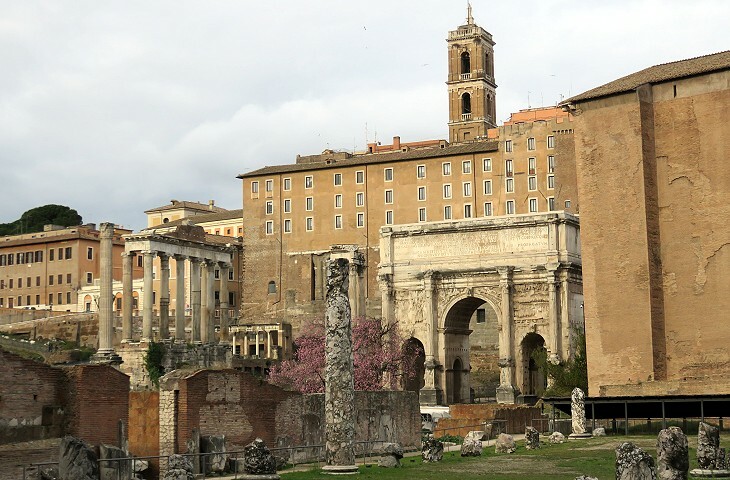 In 1803 Pope Pius VII relocated the cattle market to an area near Porta S. Paolo and promoted the first archaeological excavations of the Forum; they targeted the three columns buried in the slope of the hill (Tempio di Vespasiano). The area was thoroughly excavated after 1870 with the objective of reaching the level of the ground at the time of Emperor Augustus; this approach led to uncovering the foundations of some Roman monuments built in later periods e.g. Colonna di Foca, the column standing at the centre of the image above. The question is most of all poignant in the Forum, which I let wait a full fortnight before moving against it in the warm sun of an amiable February morning. On my first visit to Rome in 1867 I could hardly wait for day to dawn after my arrival before rushing to the Cow Field, as it was then called, and seeing the wide-horned cattle chewing the cud among the broken monuments now so carefully cherished and, as it were, sedulously cultivated. It is doubtful whether all that has since been done, and which could not but have been done, by the eager science as much involuntarily as voluntarily applied to the task, has resulted in a more potent suggestion of what the Forum was in the republican or imperial day than what that simple, old, unassuming Cow Field afforded. Read more of William Dean Howells' account of his visit to Campo Vaccino in 1908 and his views about the pros and cons of the excavations in Roman Holidays and Others. The exact purpose of the lonely column mentioned by Vasi was unknown at the time; it was thought to be the only remaining one of a series which supported a bridge between the Palatine and Capitoline hills. The excavations led to discovering fragments of an inscription at its base; they revealed that the column supported a bronze statue of Byzantine Emperor Foca and that it was erected in 608. The column was taken from another building and most likely also the (lost) bronze statue was not original. Foca was an usurper and was known for being particularly cruel, even for the custom of his time; he murdered Maurice, the legitimate emperor, and his five sons; he eventually paid a price for this crime because, after being dethroned in 610, he was skinned and then burned alive. To understand why in Rome he was so popular one must bear in mind that, because the Patriarch of Constantinople challenged the legitimacy of his power, in 607 Foca issued an edict saying that the Bishopric of Rome was the first of all sees. He then transferred the property of the Pantheon to Pope Boniface IV. 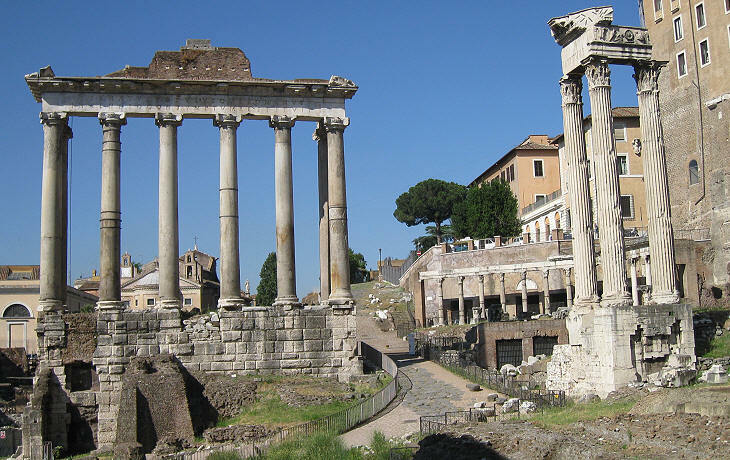 The column is the last monument erected in the Roman Forum. 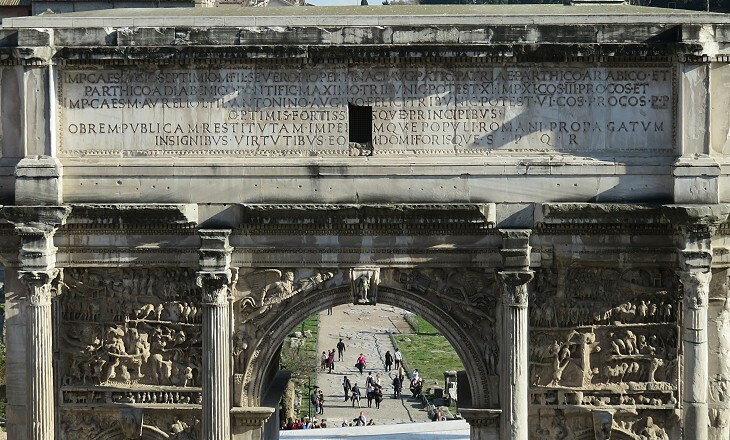 The arch was erected by the Senate in 203 AD to celebrate the tenth anniversary of Septimius Severus' rule and his victories in wars against the Parthians. 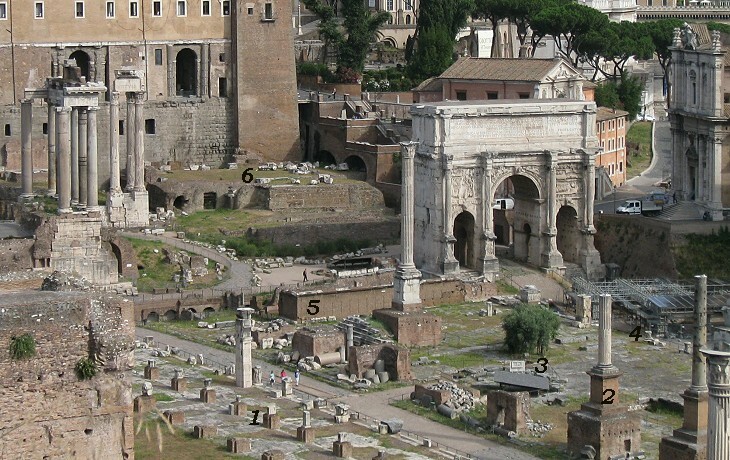 The arch was built across Via Sacra, the main street of the Forum. The level of the ground at that time was higher than it had been at the time of Augustus and therefore there is a short slope between the arch and the rest of the archaeological area. In 198 Septimius Severus appointed his elder son Marcus Aurelius Antoninus, better known as Caracalla, as co-ruler and at the same time he gave the title of Caesar to Geta, his younger son and a boy of nine. The first two lines of the long inscription list all the titles and positions of Septimius Severus, the third line lists those of Caracalla and the fourth (short) line made some reference to Geta. It was replaced by the words optimis fortissimisque principibus (excellent and very strong princes) which referred to Septimius Severus and Caracalla only. This occurred because Caracalla ordered the killing of Geta and the deletion of all references to him (not only in Rome, as one can see at Cendere Koprusu, a bridge in eastern Turkey). 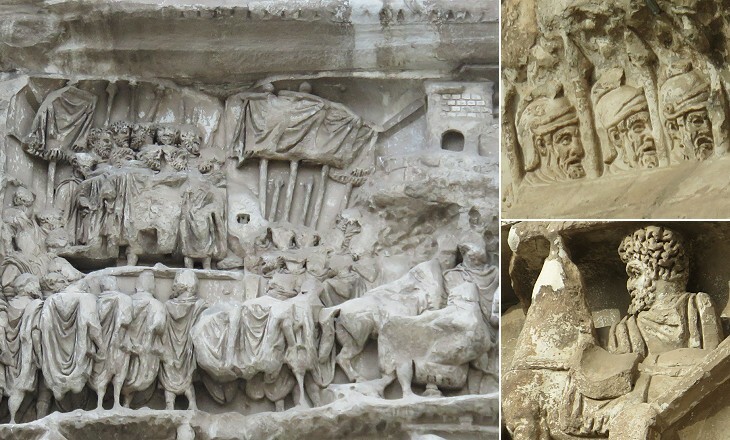 The reliefs of the arch are greatly damaged, in particular those showing events of the Parthian wars, including the conquests of Edessa (Sanliurfa) and Ctesiphon, the enemy's capital. 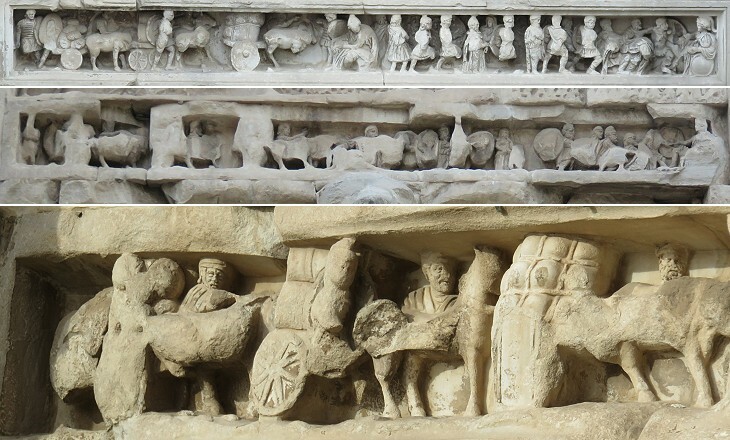 Other reliefs are in pretty good condition, either because they were buried in the ground or because they were not affected by the modifications which turned the arch into a medieval small fortress (there are four rooms inside the arch and a turret was built on its top) and later on into a storehouse of the cattle market. 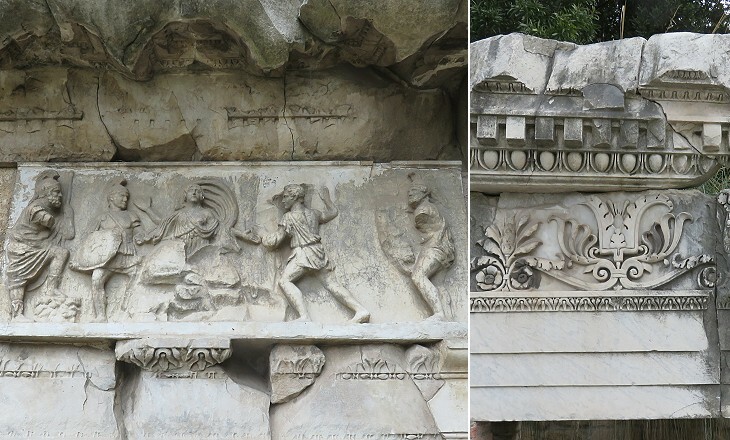 It is interesting to note that the reliefs of Colonna Trajana set a pattern for depicting a prisoner of war which was followed in this arch; although the column illustrated Trajan's Dacian Wars, whereas this arch celebrated wars against the Parthians, the prisoners made by Septimius Severus were portrayed in Dacian costumes. At least in their reliefs, the ancient Romans treated their conquered enemies in a dignified and compassionate manner. Both sides of the arch are decorated with a very low strip of reliefs depicting a triumphal procession and scenes of surrender by the enemies. 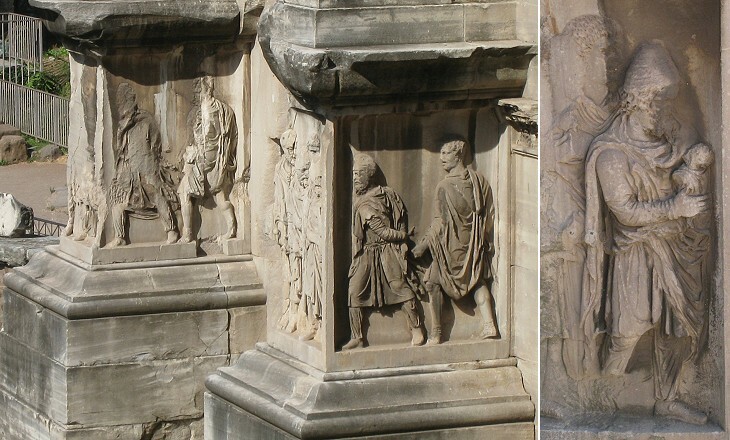 Unlike the reliefs of Colonna Traiana the subjects are almost entirely detached from the background. Travellers of the past (and maybe also those of today) were not impressed by the decoration of the arch, but by its sheer size. (In my last night in Rome in April 1788) I walked down by the steps at the back of the Capitol. There I was suddenly confronted by the dark triumphal arch of Septimius Severus, which cast a still darker shadow. In the solitude of the Via Sacra the well-known objects seemed alien and ghost-like. 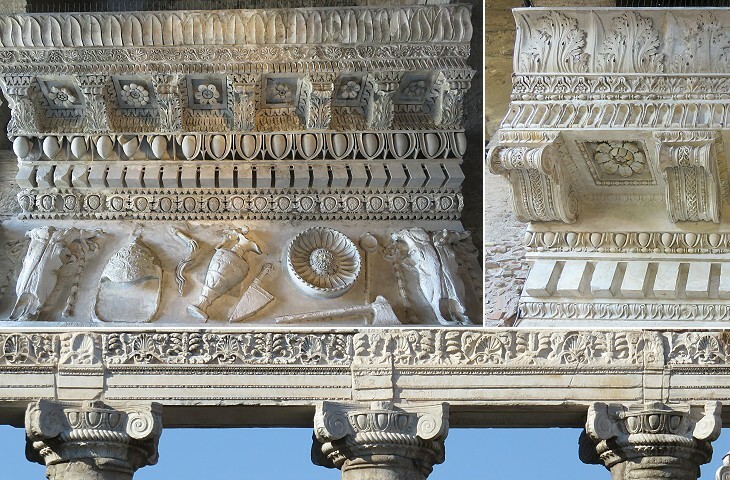 The decoration was completed by four large panels depicting episodes of the Parthian wars. They are very worn out. 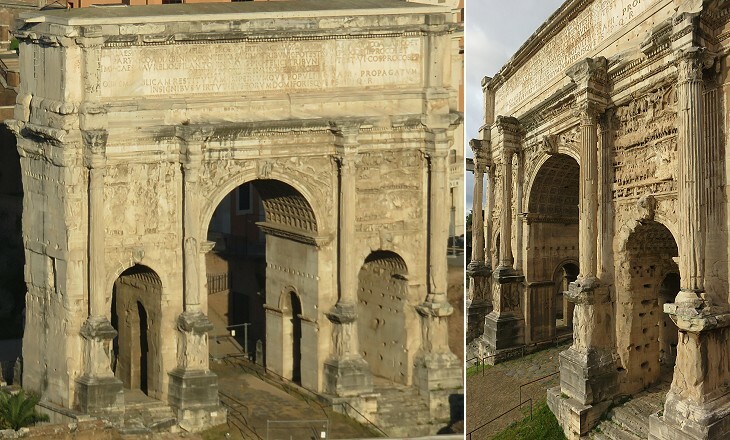 You may wish to compare this arch to another arch dedicated to Septimius Severus at Leptis Magna, his hometown. The temple which Vasi thought was dedicated to Concordia (i.e. harmony, social peace) is now known as Tempio di Saturno. The current building is a restoration of a very old Republican temple which was rebuilt in 42 BC and damaged by a fire in 283 AD. The different size of the columns shows that the restoration was made by using materials coming from other ruined monuments. The Saturn celebrated in this temple is not the Roman counterpart of the Greek god Chronus, Zeus' father, but an Italian god-king who presided over a mythical golden age; the Saturnalia were one of the main festivities of the Roman calendar; they took place around the winter solstice: slaves were allowed to treat their masters as their equals, gifts were exchanged, candles were lighted and banquets were arranged. Saturnalia are thought to have influenced some Christmas traditions. It is thought that the thick walls of the podium of Tempio di Saturno housed Aerarius, the place where the public treasure was kept. A (lost) arch to Emperor Tiberius stood in Vicus Iugarius near Tempio di Saturno. The temple dedicated to Emperor Vespasian was built by his son Domitian in 86 AD. Its three remaining columns and the cornice show great craftsmanship. Tempio della Concordia was mentioned by many ancient writers and at Vasi's time it was wrongly identified with Tempio di Saturno. It was built in the IVth century BC, perhaps by Marcus Furius Camillus to celebrate the social peace between patricians and plebeians. 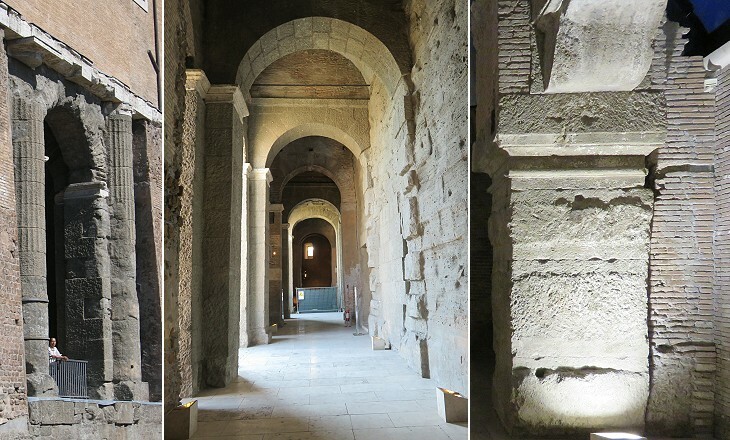 It was restored and decorated at the time of Emperor Augustus. 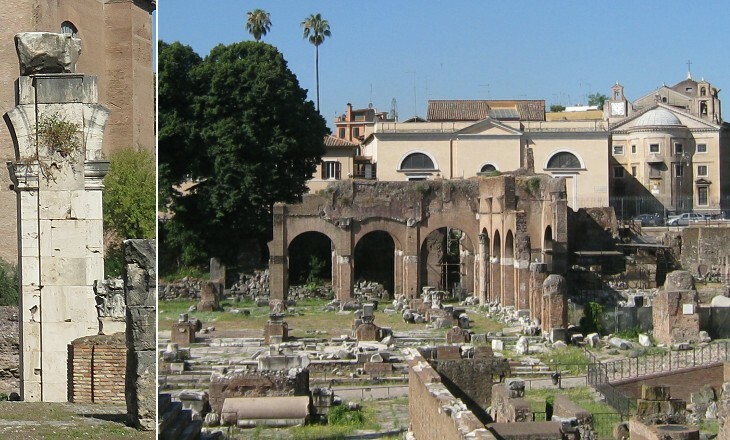 The two monuments stood opposite one another between Tempio di Vespasiano and Arco di Settimio Severo. They both had the same purpose i.e. to indicate the very centre of Rome. Miliarum Aureum (Golden Milestone) was a column erected by Emperor Augustus which was the starting point of the ancient Roman roads. 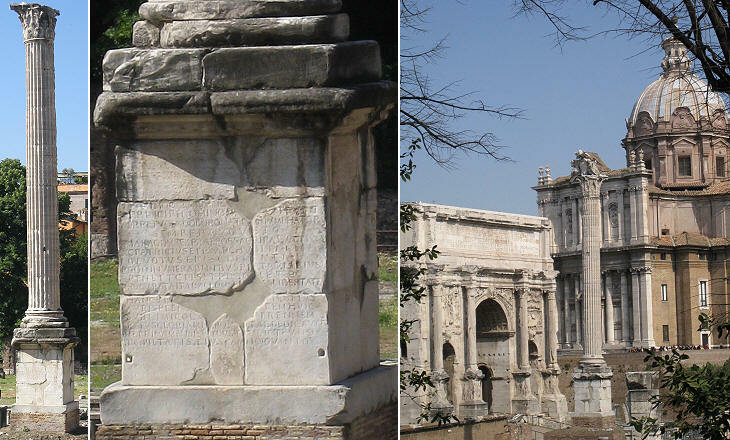 Milion, an arch having the same purpose as Miliarum Aureum was erected at Nova Roma (Constantinople) when it became the capital of the Roman Empire. Umbilicus Urbis (Rome's Navel) was a small circular building of the IIIrd century AD which resembled the omphalos which marked the centre of the world at Delphi. It might have been built on the site of Mundus, a well dug by Romulus to establish a passage towards the Underworld. The Romans did not go to the Forum to see the arches and the temples which celebrated the emperors. They went there because of the basilicas, large public buildings where business, legal and political matters were discussed and where one could learn what was going on in the city. Basilicas were usually surrounded by a portico and by arcades with shops and taverns. 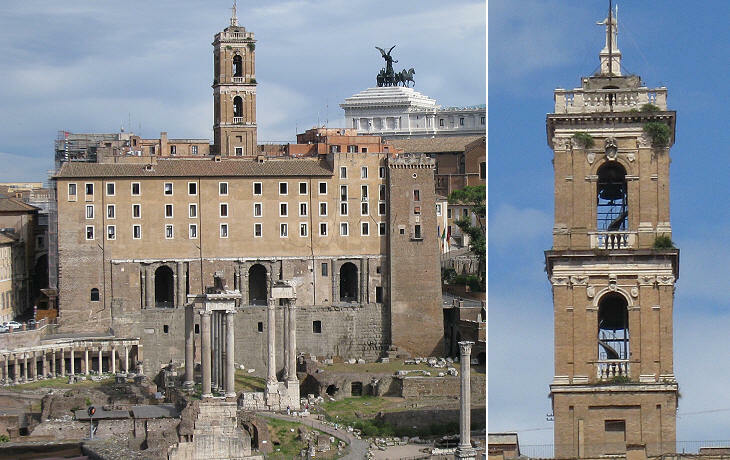 These buildings can be found in all ancient Roman towns. You may wish to see those at Pompeii and Ephesus (the latter was turned into a church). 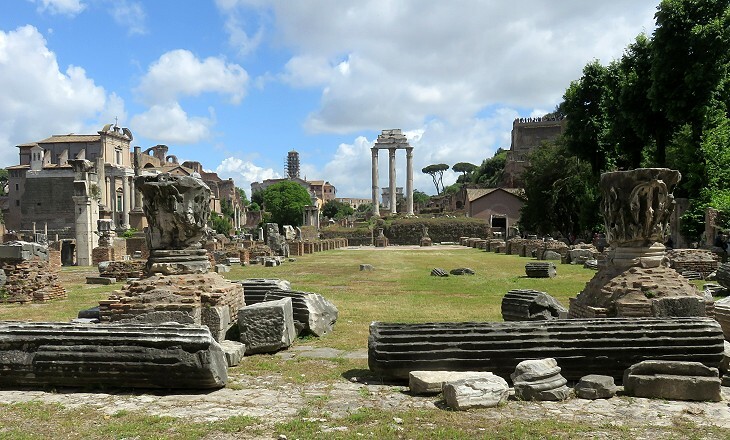 Basilica Julia was named after Julius Caesar who began its construction in 54 BC on the site of a previous basilica. 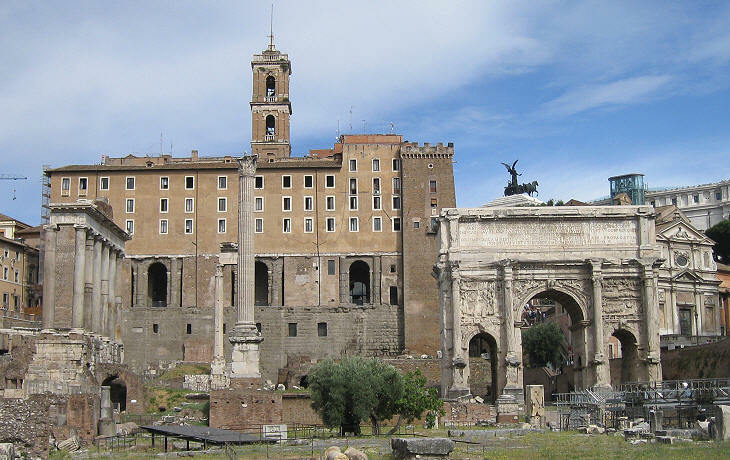 It was completed by Augustus who then rebuilt it after a fire in 12 BC. The building had five naves and it became a model for the construction of the first large Christian basilicas and in particular for S. Pietro and S. Giovanni in Laterano. The view taken from Orti Farnesiani shows that Palazzo Senatorio stands on top of Tabularium, the building which housed the tabulae, the official Roman records of laws, treaties, appointments, etc. The bell tower was built during the pontificate of Pope Gregory XIII and it replaced a medieval one. It was designed by Martino Longhi il Vecchio and it had on top a statue of Rome holding a large cross (actually it was an ancient statue portraying Diana). After 1870 this statue was replaced by another statue representing Rome, but without the cross; this was done to show the new lay function attributed to the building (it houses the Town Hall of Rome). In the XIIth century Palazzo Senatorio became the house of Comune di Roma, the city-state system which at the same time was being adopted by many other Italian towns. The government was entrusted with a small parliament, the members of which were elected on a borough or guild basis. The presence of the Pope limited the authority of the municipal institutions, however in the XIVth century, when the Popes set their residence in Avignon, Rome was ruled as an independent Comune. In 1398 fights among different parties led municipal authorities to request the protection of Pope Boniface IX who built a tower to strengthen the defence of the palace. At the same time most of the other Italian Comuni passed into the control of a family (Medici in Florence, Visconti in Milano, etc. 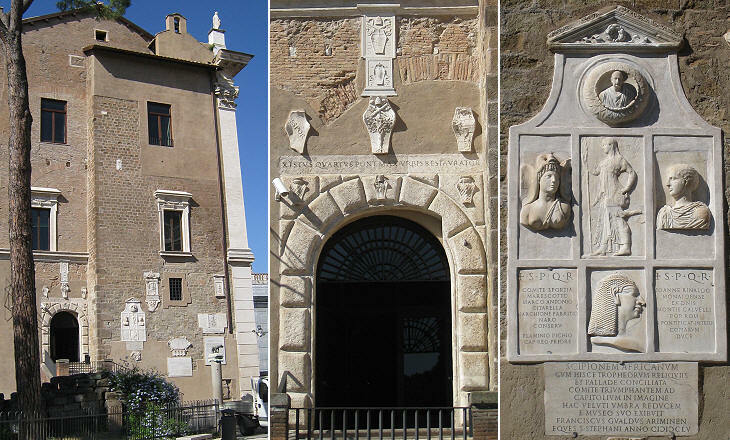 ), so what happened to Comune di Roma was part of a general decline of this institution. 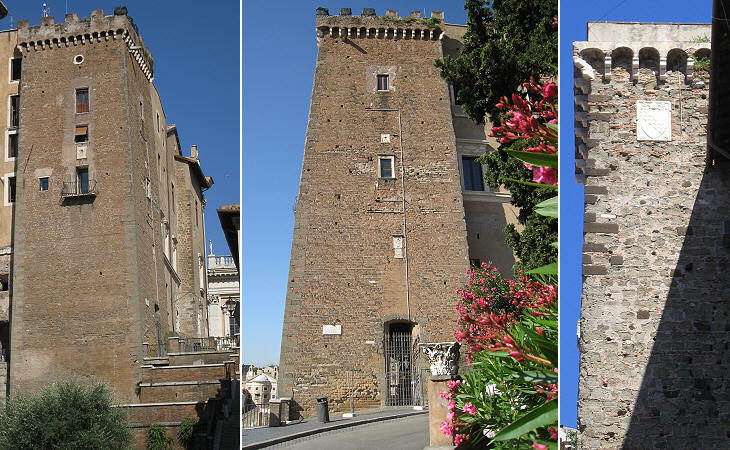 In 1453 Pope Nicholas V built a tower on the north-eastern corner of the building. 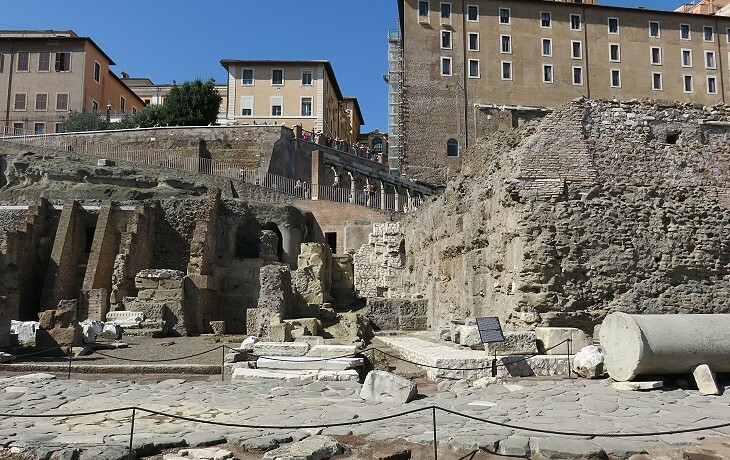 The small balcony on the side facing the Forum belongs to the office of the Mayor of Rome. 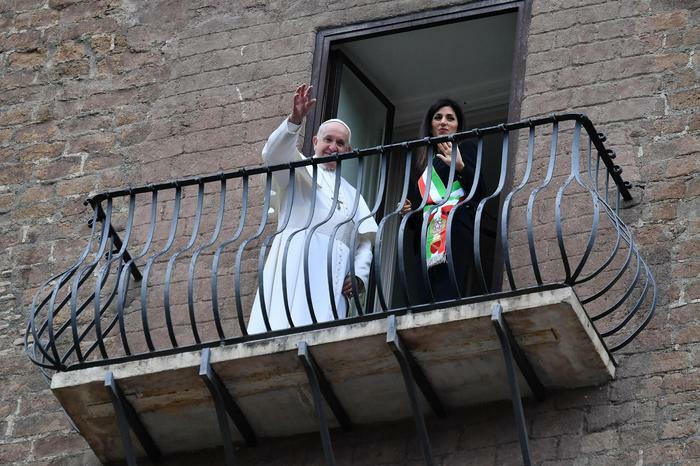 The Mayor uses it to show the monuments of Rome to his/her distinguished guests (see Mayor Virginia Raggi on her first day in office in June 2016 - it opens in another window). The main access to the hill was from the Forum. In the XVIth century a ramp was built on its western side and Michelangelo designed a large square and a new grand entrance to Palazzo Senatorio which however is used only in exceptional cases. The more modest entrance built by Pope Sixtus IV that is shown above is the ordinary access to the building. 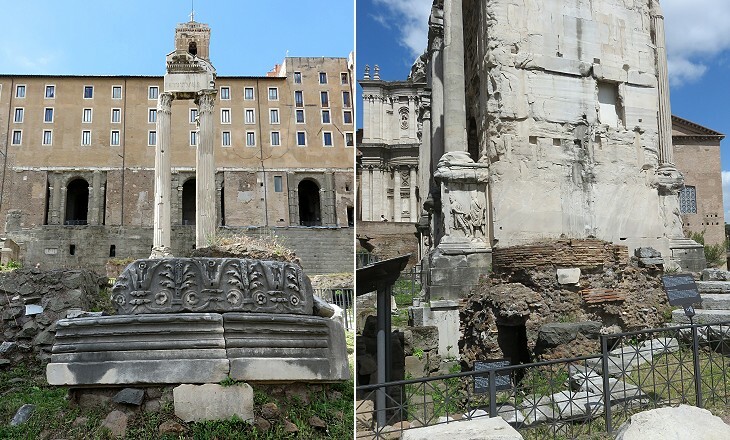 The first attempts to reconstruct the whole appearance of Ancient Rome from the remaining buildings, date back to the XVth century. In 1553 the painter and architect Pirro Ligorio published Libro delle Antichità di Roma (Book on the Roman Antiquities) dedicated to Cardinal Ippolito d'Este for whom he had designed Villa d'Este, which was followed by a double map showing both modern and ancient Rome. 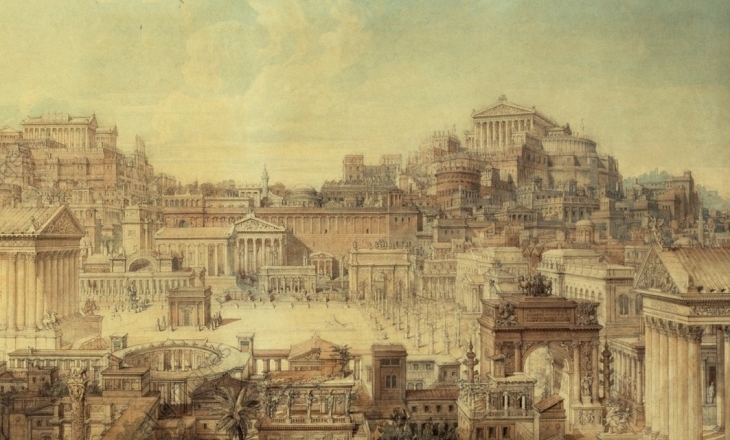 In Reverend Jeremiah Donovan's guide to Rome published in 1844, a description of the monuments of the Forum was accompanied by an etching by Gaetano Cottafavi which showed their ancient appearance. It was based on a watercolour by architect and archaeologist Charles Robert Cockerell (1788-1863) (it opens in another window), who was for many years the Architect of the Bank of England. 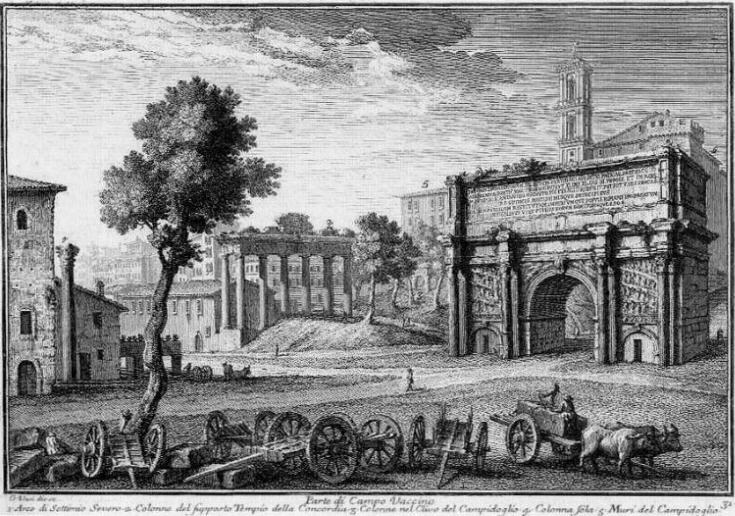 Next plate in Book 2: Parte di Campo Vaccino verso l'Arco di Tito. Next step in Day 1 itinerary: S. Pietro in Carcere. 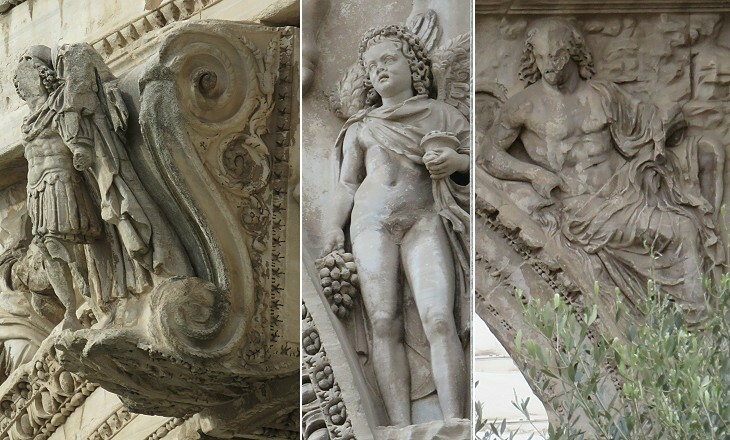 Next step in your tour of Rione Campitelli: Tempio di Castore e Polluce. Prese un tal nome questo spazioso e celebre luogo dal mercato di bovi, ed altri animali da macello, che in esso ora si sa, a similitudine, dell'antico foro boario. Fu però questo il più magnifico e splendido sito in tempo di Roma trionfante, e si ravvisa ancora dalle copiose, e maravigliose rovine, che vi sono rimaste: onde per osservare tutto, e con piacere, cominceremo dal mentovato palazzo Senatorio dalla parte però, che guarda il campo. Gli archi chiusi entro le mura del medesimo, si crede, che fossero dell'antico Tabolario, in cui si tenevano le tavole della Legge; le tre colonne quali sepolte nel clivo, con capitelli e cornici lavorate alla corintia furono del tempio di Giove Tonante fatto da Ottaviano Augusto per difesa del Campidoglio, e le otto colonne di granito egizio con capitelli e cornice dorica sono del tempio della Concordia. L'arco, che si vede mezzo sepolto, lavorato tutto di marmo salino con bassirilievi, e colonne striate fu eretto dal Senato e Popolo Romano a Settimio Severo, e la gran colonna isolata, che si vede poco discosto, con capitello corintio, niuno ha saputo trovare di quale edifizio fosse.